Putting our money where our mouth is, carphile.co.uk have only gone and bought a barn find from France. 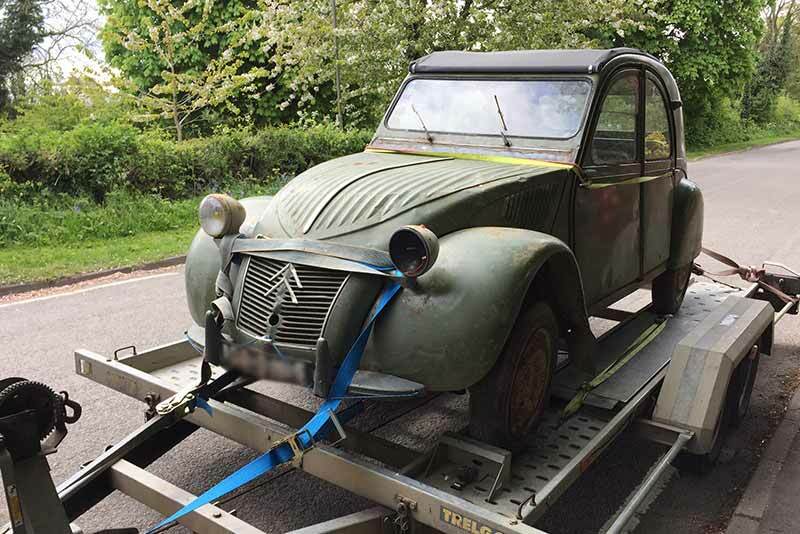 In this new blog series we’ll examine the highs and lows of buying a Citroen 2cv AZ, from buying a car online to either restoring it to its former glory, barn find chic or going broke while trying. Lets get this out of the way. Despite advising people over the years about the right and wrong way to buy a car (usually whether they wanted it or not), I broke the golden rule of online car buying, handing over cash to a man I’d never met, in another country to buy a car I had never seen. If it sounds exceptionally foolish, that’s because it is (please don’t follow my lead) and reading back that sentence, I feel a bit sick. So how did this come about? At carphile.co.uk we spend a lot of time watching prices of the glamorous and not so glamorous classic cars for sale. I’d been pondering for a while that it would be good to move from classic car price observer to owner. To buy a project car, get hands dirty, learn some new skills and hopefully put a classic car back on the road while maybe even adding a little value in the process. This lead to months of looking at Austin 7’s and Austin-Healey Frogeye Sprites and many other flights of fancy. Then Andrew Frankel wrote in Autocar about how much he loved his Citroen 2cv AZ. I followed this up by watching Top Gear presenter Chris Harris’ video online about his early 2cv. And that was all the encouragement necessary to tap ‘2cv AZ for sale’ into Google. Citroen 2cv prices have climbed a lot over the last few years and rarer early 2cv’s, have climbed higher still. The first 2cv AZ for sale I found was in Sweden at £12,500. The second, at £8,500 in the Netherlands. Despite fuelling cross-country, daydreams of cross-country European adventures, at 40mph (flat out), the economic reality of spending over £12k on an immaculate 2cv, almost, injected enough common sense to end this daydream and keep the bank balance unharmed. Dejected and close to giving up, I typed the search into an online auction site and that’s when this came up. This or course is where I’m supposed to say I did my research, got in touch with 2cv specialists or old 2cv experts at the UK 2cv club and found out what to look for. Of course I did none of that. I already own a much later 2cv, how different could they be? (in hindsight, quite a bit!) And at £1,500 this 2cv AZ had it all. Barn-find glamour, the right price tag and project potential as well as admittedly more negative points like rust, dents, holes, an unoriginal engine and the small point that the car hadn’t turned a wheel in 15 years. Oh, and it was located almost 700 miles away in France. However, the vendor’s description did seem honest (the description ‘most panels are dented’ must be the most honest marketing I’ve read in the 21st century) and there were even a few positives in there to balance the negatives – good chassis and the fact the engine started. To cut a long story short, the price rose steadily to £2500 over the next few days and when the bidding ended at £3350, for better or worse, my bid was the highest and the (unseen) 1959 Citroen 2cv AZ was mine. There are a few things to think about when buying a non-running classic car from the EU. Logistically there are the costs of transporting the car to the UK, you also need to be sure the person selling the car has all the correct paperwork (registration document, ownership history, receipts, etc) and that you’re not buying a stolen car. Finally, you need to factor in whether you will have to pay any import duty or VAT to HMRC to bring the car into the UK. It’s worth doing your research and factoring these costs into your purchase price (before buying the car). Transporting the Citroen to the UK was easy. Before the auction ended I’d made contact with the owner who said that he would deliver it (from South West France) for £350, which seemed a very good deal. The advert also confirmed he had a Carte Gris (the French registration document) and the bill of sale. Which leaves us with import duty. I brought the 2cv AZ in as a personal import, as the car was built in 1959 it is deemed to have historical significance and as it was built in an EU country there was no VAT to pay. (Please note that this has been written Summer 2017, while the UK is still a member of the EU, post-Brexit these rules may change). Also if you’re importing a classic car from elsewhere in the world, for example the United States or Australia, the rules are different (and you may be liable to pay VAT and import duty – check before buying!). The day of delivery arrived. I’d made phone contact with the owner who turned out to be a Citroen 2cv restorer. This was good as the UK classic Citroen 2cv community is small and he knew a lot of people, in the UK 2cv club (2cvGB) that could vouch for him and put my mind to rest that I wasn’t sending money to a scammer abroad. Not so good perhaps is that I’d bought a car from a Citroen 2cv restorer. What state was the car in for him to sell and not restore it himself? (To find out keep reading) but he assured me it was that he was too busy with other projects rather than anything else. What you can also do is look at not just the sellers rating but their past transactions as well. Have they sold similar items before and, if so, were their customers happy? What I did was paid 25% and the delivery charge and agreed that he would receive the remainder upon delivery. This meant that if he didn’t show up then I wouldn’t have lost the full purchase price. In-turn, if he delivered the car and I tried to barter the price down or pull out of the deal, he wouldn’t be out of pocket. If you are buying through Ebay, we’d reccomend completing the process through Paypal (and reading the terms and conditions carefully), do this and you should be protected. The good news is that, as you can see from the picture below, the car arrived and the transaction was completed without a hitch. The bad news is that once you have bought a classic and completed the deal then (obviously) everything that needs doing to it is, very suddenly, entirely your problem. In the case of this classic citroen 2cv AZ barn find, years of make do and mend bodgery, followed by years of barn neglect have taken their toll. There is a lot to do. 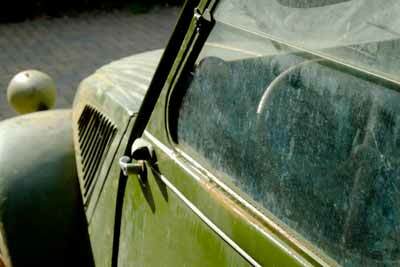 That’s it for Part 1 of this Citroen 2cv AZ buying/restoration story. In Part 2 we will deal with making a Notification of Vehicle Arrivals (or NOVA) declaration to HMRC and examine the car and make a plan to get the car back on the road.